Redecorating the guest room, which was such a priority just before the holidays, has slowed way down. Thank goodness! I have been enjoying some time off from that project. I was just in there, though, sitting in the comfy chair, pondering some rearranging. 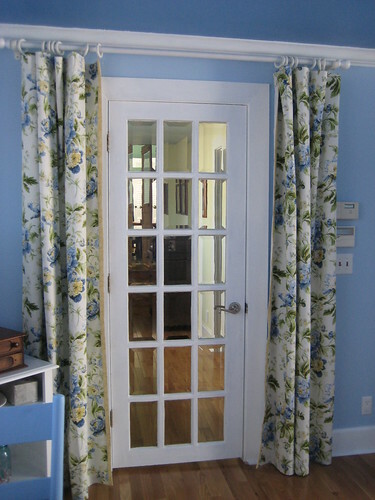 I realized I hadn’t shown you the drapes! 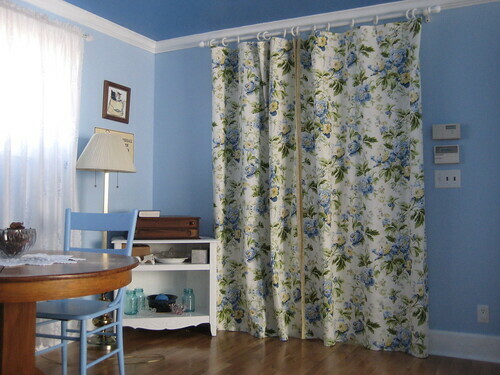 Laurie, my very sweet and dear friend, volunteered to make the drapery panels for the room. Laurie saw this idea in a decorating magazine. So cute! And it leaves the beveled glass door panes free of covering, which I like a lot. Here, they are pulled to the left. They can stand at both sides of the door. Or be pulled shut when privacy is wanted. I have the panels for the window on the left wall in this picture. Laurie is working on the ones for the opposite larger window. For the holidays, we repurposed sheer panels that came from the master bedroom, which got new panels this year. These look perfect in this room and I plan to leave them up, under the drapes. I *love* them. Exactly what I had in mind. 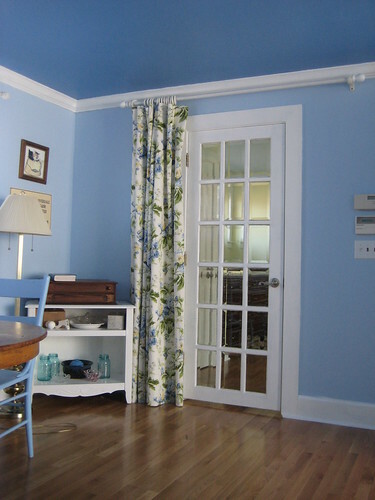 BTW, I also love, love, love the darker blue ceiling! This room has 8′ ceilings and I was worried the dark color would not work. But it looks great and gets a lot of compliments when visitors see the room. This entry was written by ~~Rhonda, posted on February 22, 2009 at 3:12 pm, filed under remodeling and tagged guest room, redecorating. Bookmark the permalink. Follow any comments here with the RSS feed for this post. Post a comment or leave a trackback: Trackback URL. I bet you have fun redecorating your rooms to fit your needs! What a lovely room! Can we come visit and hide out in the peaceful blue room?